Many of you must realize that I changed the domain of this blog to discovery and wonder.com. The primary reason was to include audio files and extended video files. However, I also decided to split the About page into two parts: one dealing with the purpose of the site itself(a work in progress) and the other dealing with me and my family. I thought this would be a far more effective way of presenting the site. I am also introducing two new categories: Something to Think About, and Just for the Feel of it. The former category will offer selected quotes or sayings, which I hope will be of interest. The latter category will offer brief excerpts from heretofore untranslated Russian children’s stories and novels. I must say, however, that I have suspended The Writer’s Friend, and the corresponding blog. I am working on The Fence and The Field: A Writer’s Gateway to Self, which includes some of the exercises from that blog. In concluding, I would like to thank my 86 followers for looking at my posts and offering thoughtful comments. May this be a year of peace and discovery for all. And thanks, Mom, for the memories. 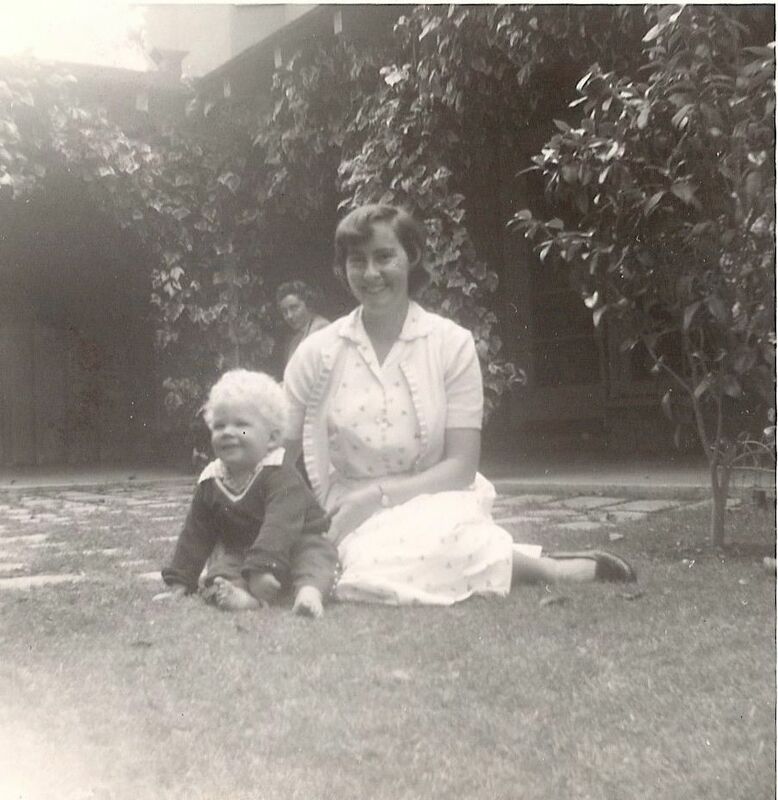 Mom and I celebrating Mother’s Day 1954. I learned that Mom is in critical condition and that it’s only a matter of days. I have much to reflect on in the coming week, but I try to stay positive. She has been ailing for some time, so the news is not unexpected. However, it’s difficult to lose a family member. I wish my family the best. 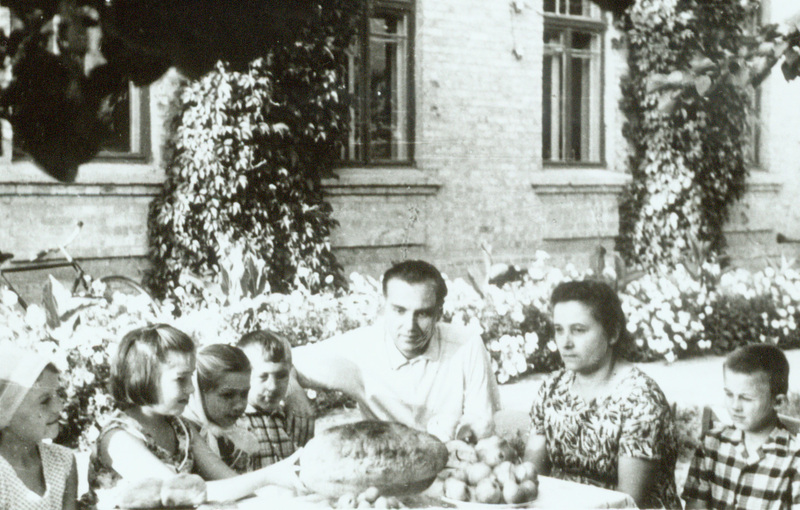 Remembering Mikhail Krasovitsky: Vasilii Sukhomlinsky: The Ukrainian Teacher, Part 2. Only now is it becoming clear what courage Sukhomlinsky showed in actually coming out against the one-side conception of the dynamics of children’s collectives, a conception, sanctioned in theory and practice: the stringent demands, the linking of responsibility and dependence, the subordination of personal interests to the interests of the collective. In his opinion, the main thing was to create a healthy community of children in which an atmosphere of respect for the individual and for the interests of each child within the community fostered the good. It is known that in former socialist society an atmosphere of hostility developed in relations among people, including rudeness, malevolence and disrespect for individual identity. That atmosphere left its mark on the schools, as well as in teachers’ attitudes towards students. Even now, lack of culture often predominates, trampling on a child’s self-respect. In these circumstances, one hears Sukhomlinsky’s voice: “Benevolence, reasoned goodness, that’s what should be basic to the life of a children’s collective. How beautiful this world is, and, at the same time, how profound, how complex and many-sided, the goodness of human relations. Sukhomlinsky came out against our practice of group discussion of a student’s misdeeds. The so-called “personal matters” method of imposing a form of conduct defined for adults was introduced in its distorted form in the schools. In extreme cases, such group pressure(literally, torture) led to suicide. And Sukhomlinsky insisted that it is inadmissible to take as an example for discussion in a collective the misdeeds of a child related to abnormal family circumstances, parental arbitrariness, the mistakes of the teacher, or perhaps a child’s response to some intimate experience. “It might occur to the teacher to ask,” writes Sukhomlinsky, “What is it that is useful for the collective to look over in the child’s behavior? Nothing. It is difficult for the American reader to understand how courageous one had to be to resist in thought or deed the authoritarian pedagogy in those years. Sukhomlinsky paid for it with his health. He was constantly persecuted by zealous guardians of Leninist-Marxist dogma, or by those who were just spiteful, such as Boris Likhachev. Yet he was awarded the Medal of Socialist Labor. He became a corresponding member of the Academy of Science of the USSR. He was awarded every kind of honor. His books were published, although some of his publications were warehoused for twenty years. We have to allow that Sukhomlinsky, like many others, had to praise the Communist party in his works. He had to write about teaching schoolchildren devotion to the ideas of communism, though it was obvious that many of these ideas contradicted his humanistic view. If he had not, his work would not have seen the light of day. But very frequently, using communist phraseology, he came out against lies in educating children. For example, he asserted that it was inadmissible to create an atmosphere of “ideological sterility” around children and young people, to close one’s eyes to what is evil, unjust, vicious, or inconsiderate in life. He insisted that above all the teacher must display honesty. The posthumous fate of Sukhomlinsky’s works recapitulates the fate of many progressive ideas in our country. Sukhomlinsky’s books were published, his birthday celebrated. The Pavlysh school bears his name, and his daughter, Olga, is the head of a department in a Ukrainian teacher research institute. Conferences take place celebrating his work, but only a small percentage of teachers have read his works in the original. So, unfortunately, many of Sukhomlinsky’s ideas are entirely excluded from the schools. One of Sukhomlinsky’s books is entitled, I Give My Heart to Children. And I believe that says it all. Remembering Mikhail Krasovitsky: Vasilii Sukhomlinsky: The Ukrainian Teacher, Part 1. Mikhail Krasovitsky was the former Director of the Institute for Advanced Teacher Training in the Ukraine. He was also a member of the Advisory Board of Medford Education International, and a participant in the Educational Reform Symposium. A man of considerable learning, and a vibrant personality, he was a supporter of Ukrainian educator, Anton Makarenko, who worked with troubled teenagers that were displaced by the Russian Civil War of 1917 and World War I. Makarenko’s Pedagogical Poem(with a nod to Dante), delineates his struggles with local authorities and his would-be delinquents and how his adolescents become responsible human beings. He does not shy away from depicting life as he sees it, not refraining from coarse terms, corporal punishment, class warfare and the like. The book makes for compelling if disturbing reading today. But Mikhail was also intrigued by the personality and teaching approach of Vasilii Sukhomlinsky, perhaps the greatest poet of all the famous educators. Sukhomlinsky recognizes the enormous impact nature has on a child’s developing mind. In the following article, Mikhail gives a moving and informative tribute to this outstanding teacher. Parenthetical comments are mine. He died in 1970 at the peak of his creative powers. (He died from shrapnel he received while fighting in the war. The doctors were amazed he had lived as long as he had, so great was the internal damage surrounding his heart.) He was a teacher and school director(principal) in the village of Pavlysh located in the Ukrainian steppes. He believed in the beautiful world of childhood. To one teacher who was beginning to be exasperated by children, Sukhomlinsky responded in this way: “There is nothing in a child that requires a teacher to be brutal(At that time corporal punishment in school was common as it was in the U.S. and elsewhere. Children were not considered as fully developed human beings, a major principle of Polish educator, Janusz Korczak. ), and if vices or flaws arise in a child’s soul, then those evils will be overcome best of all by kindness… I abominate nagging suspiciousness of children. I abominate the formalistic regimentation of demands and prohibitions. Sukhomlinsky thought the most important element of a humanistic education was the ability of a teacher to expereience the world of childhood, to see the world with the eyes of a child. He wrote: “The child’s world is a special one. Children live by their own notions of good and evil. They have their own criteria of beauty. They even have their own way of measuring time: in a child’s world a day is like a year and a year–eternity. (For more on this topic, see Jean Piaget’s, The Child’s Conception of Time, and Kornei Chukovskij’s, From Two to Five.) In order to enter into this fairy tale palace whose name is childhood, you must be reincarnated, become to a certain extent a child. Only under such circumstances will you be able to exert a benevolent authority over the child. The area of the Pavlysh school is located in a unique site. Here Vasili Sukhomlinsky created “a school under the blue sky, which became the most important factor in the educational development of his students. The pride of the school was its garden: pear and apple trees looked in the “green classes” from all sides. In one of the corners of the schoolyard the children planted grape vines; in other places there were green glades, flower beds with roses, chrysanthemums, tulips. There was also a little corner for dreams(a gully behind the school), an island of wonder where under the green tree tops children made up and told fairy tales. There were even little groves of trees in the schoolyard. The parents had built the children a greenhouse, so that the school cafeteria would always serve vegetables. All this was a marvelous aid in helping the children study, dream, create fairy tales, listen to the music of nature. In the Pavlysh school there was a tradition: the little ones planted trees in the spring, apples and grapes for their mothers, fathers, grandmothers, and grandfathers. Then they brought their relatives the fruit grown by their own hands. Vasili Sukhomlinsky taught little children to feel and understand another person’s spiritual state, to empathize with him/her. Not far from the school there were women working on a sugar beet plantation. Sukhomlinsky taught the children to look into their faces, and try to feel and understand what each was feeling–untrammeled peace or the dark cloud of grief. In order to teach children compassion, sensitivity, and sincerity, Sukhomlinsky wrote the text Thoughts About a Person. These are short stories, which were intended to arouse feelings of charity and compassion in his students. Here are some themes in the conversational tales: Why are there tears in the grandmother’s and grandfather’s eyes/ Think about how your actions might affect another person’s feelings. In real life situations Sukhomlinsky taught his students sensitivity, charity, genuine humanity. On the outskirts of the village lived a girl Natalka. From early childhood she had been very ill, and could no longer walk. Natalka’s whole world consisted of a green courtyard, an apple tree, two beehives, a well, storks on the shed, the dog Palma and rabbits. Doctors took care of her, but did not promise to cure her. The children and the teachers came to her assistance. They planted many flowers in the courtyard. The teachers came to her house, and taught Natalka to read and draw. They brought her to school for the holidays. In two years she was back on her feet. The doctors said it was not only medicine, but joy that cured her. 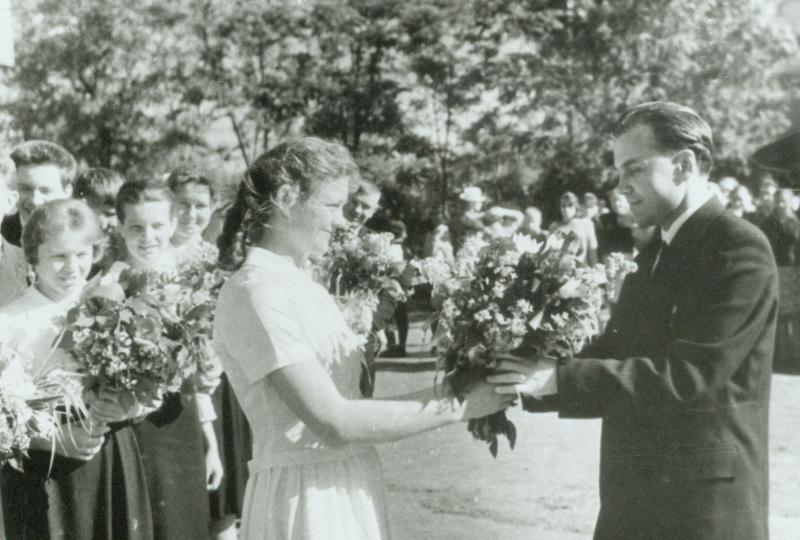 Vasilii Sukhomlinsky accepts flowers at graduation. “It is so easy to forget that the essential you… might be lost, and that the you might forget to remember from whom or what it came.” –Ronald Rolfe, geneticist. It was my pleasure to have met Mrs. Rolfe at a time when my ideas were just beginning to develop. When I was a child of six, I used to come over to her home to play piano and spoke of my conceptions of music. She then moved away and I never thought I would see her. However, during a troubled period in my life in my late teens, she returned to the very same house she had lived in earlier! I met her at a march of candles for Soviet Jews and discussed some of the novels I had been reading. I was most gratified to have found an informed literary companion. Sarah Seff Rolfe or Rose Rolfe(her preferred name) became my poetry mentor and good friend. She had come from Minnesota, where she had studied with Robert Penwarren. She had a long correspondence with Jewish theologian, Martin Buber, and adapted his Hasidic Sayings in her collection, Songs of Legacy. In North Hollywood, California, she took active part in poetry readings and took classes in Everywoman’s Village. However, she did not publish a book of poetry(Terebinth Press) until one year before her death in 1984. She titled her book, Heart And Mouth Are One. The book was encouraged by her teacher, Carol Lem. Mrs. Rolfe inspired me with a sense of the mystical and profound elements in nature. She was a master at revealing human nature in its contemplative, reflective, troubled moods. Her poems are quite musical. In fact, some of her longer pieces resemble musical compositions; starting with a melody, developing it through skillful rhythmic and word changes, transitioning into new harmonies, but still staying with the one original pattern. I can still hear her musical voice, absorbing every nuance of every syllable. Her voice was very similar to Barbara Luddy’s “Lady” in the Disney film Lady and the Tramp. She often invited fellow poets over for an evening of poetry and and analysis. She was patient and kind with my early endeavors and always supportive and encouraging. To remember her, I am including Blue Pawn, one of the best poems that she wrote. Very old, the dealer said, Navajo. the craftsman who shaped the necklace. his art, sun-baked hands holy with care. of turquoise… tear from the matrix. Indian Gods of many Weathers–touch. trembles in the rite of stars… plays.